GOVERNMENT: Independence from Britain and Egypt, 1956. Republic with president elected by universal suffrage. Governing bodies: 400-seat National Assembly (legislative body), with 275 members elected by popular vote and 125 elected by National Congress. Sudan is the largest country in Africa and one of the most troubled. Almost from the moment it won independence in 1956, political violence and civil war have torn the nation apart. In part, these difficulties reflect longtime divisions between the various ethnic and religious groups that occupy the region. In part, they are the result of colonialism and conquest by the British, Turks, and Egyptians. Global politics and struggles over resources such as oil have continued to trouble Sudan’s complex political life. 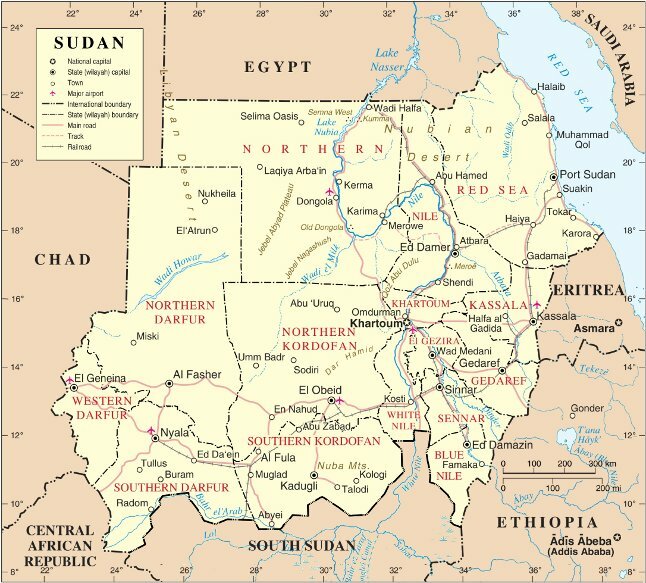 Sudan occupies almost a million square miles of highly diverse terrain in northeastern Africa, an area greater than that of the United States east of the Mississippi River. Stretching nearly 1,200 miles from north to south, the country straddles three distinct environmental zones: the desert, the SAHEL, and the tropics. The SAHARA DESERT dominates the northern third of the country, from the border with EGYPT to the Sudanese capital of KHARTOUM. South of Khartoum lies the Sahel region, a semiarid zone that covers most of the country. This region receives just enough rainfall to support short grasses, scrub trees, and crops such as sesame and sorghum that need little water. In the eastern Sahel, many people use water irrigation to grow crops; in the western Sahel, most Sudanese are pastoralists, raising herds of animals. The most southerly portion of Sudan has a tropical climate, with about twice as much rainfall as in the Sahel. In times of peace, the country’s most important cash crops are grown in the south. However, the ongoing civil war has disrupted agriculture in this part of the country. Settlement in Sudan, as in Egypt, depends for its life on the NILE RIVER. The White Nile River rises in UGANDA and flows north across the Sudanese border into the Sudd, the world’s largest permanent swamp. Half of the river’s water evaporates in the swamps before the remaining stream continues north. The Blue Nile has its source in ETHIOPIA, which borders Sudan on the southeast. The Blue Nile and White Nile Rivers meet at Khartoum and flow as one toward Egypt. Over half of Sudan’s population lives along the Nile or its tributaries. For the most part, Sudan consists of a large, rolling plain, broken occasionally by baobob trees and formations of volcanic rock. Several mountain ranges rise from the landscape, including the Nuba, Marra, and Immatong ranges. The country’s highest point, Mount Kinyeti, looms 10,456 feet above the border with Uganda. A line of hills and low mountains also lie inland from the Red Sea coast. The area occupied by Sudan has historically been home to a many ethnic groups with various languages, social customs, and political structures. Its ancient history includes the kingdom of NUBIA, which had close relations—and conflicts—with the pharaohs of Egypt. But Sudan was not united politically until about 1500, when a series of major powers began competing to control the region. Around 1504 Muslim immigrants from Arabia united with the local Funj dynasty of northeastern Sudan to form the Funj Sultanate. This Islamic kingdom was ruled by noblemen whose rank depended on their blood relation to the monarch. Diverse groups of people lived within the kingdom, growing crops and raising livestock in small settlements. They paid tribute and taxes for the right to live and work on the land. Throughout the 1500s the sultans of Funj successfully fought off attacks by the powerful Ottoman Empire, which had its bases of power in Turkey and the Middle East. During the 1600s the Funj expanded their kingdom and opened trade routes to the Red Sea and Arabia. Their capital city, Sennar, grew large and prosperous. However, by the mid-1700s internal divisions weakened the sultanate. In 1821 the Ottoman ruler of Egypt, Muhammad Ali conquered the tottering remains of the Funj Sultanate. His main goals were to capture slaves to build up his army and to exploit Sudan’s natural resources. He took thousands of captives during his raids, but many died on the journey through the desert to training camps in Egypt. Because his plan to obtain soldiers from the Sudan failed, Muhammad Ali focused on exploiting resources, growing cash crops such as cotton. He earned money through the sale of these crops and through the heavy taxes imposed on the people who grew them. The Ottomans divided Sudan into provinces ruled by Islamic governors appointed by the Egyptian government. However, the governors had little control over the rural areas of their provinces. The rulers who followed Muhammad Ali introduced administrative changes to the system. They named some Sudanese to government posts, and Arabic gradually replaced Turkish as the language of government. By the mid-1800s the Ottoman rulers expanded their authority to include southern Sudan because of its natural wealth. Traders and merchants from Europe and the Middle East saw the opportunities for profit, and they created a thriving trade in slaves and ivory. The SLAVE TRADE reached such devastating levels that European countries put pressure on the Egyptian government to end it. The Egyptians sent several expeditions to fight the slave traders but had limited success. In most cases the expeditions were led by Europeans. Many Sudanese complained bitterly under the burden of high taxes, foreign rule, and the violent campaign against the slave trade. Large numbers of people supported the rebellion launched in 1881 by Muhammad Ahmad ibn Sayyid Abdullah, a holy man who proclaimed himself al-MAHDI, meaning “the expected one.” According to legend, the Mahdi would appear in order to restore the purity of Islam and liberate the people from Ottoman rule. Supported by pastoralists from the north, al-Mahdi and his followers defeated the Egyptian armies and captured Khartoum in 1885. He established a Muslim state ruled according to religious principles and laws. Al-Mahdi himself died a few months after his victory, and the task of running the new state fell to his successor Khalifa Abdullahi. Controlling most of what is now Sudan, the Mahdists fought constantly with their neighbors. In 1898 a British-Egyptian expedition led by Herbert Horatio Lord Kitchener captured the Mahdist capital and put an end to the Mahdist state. By that time, several European powers had become well established in northeastern Africa. In Sudan, the British and Egyptians jointly ruled the country in an arrangement known as the Condominium. Under the Condominium, a British governor-general had final authority over civil and military matters. The Egyptian government appointed this official based on recommendations from the British—Lord Kitchener himself served as the first governor-general of Sudan. The Condominium administration divided Sudan into provinces ruled by governors. Until World War I most of these governors were, like Kitchener, army officers. However, in the mid-1920s the British began a program of turning the Sudanese against themselves. They began to choose governors from among the indigenous Sudanese leaders. They also began to treat the country’s northern section, where most of the people were Muslim, quite differently from the southern areas, where most people followed traditional religions. In separating the north from the south, the British hoped to prevent Islam from spreading southward. The British provided education and economic opportunities in the north, while neglecting the south. The two halves of Sudan also grew apart in their culture and language. The so-called Southern Policy has had devastating effects on Sudan and has been a factor in the civil wars that have raged in Sudan since its independence. From the 1930s to the 1960s fervor for national independence swept across Africa, and Sudan was no exception. Though the movement started among a small group of intellectuals in Sudan, it soon split along religious lines into two main political parties. The National Unionist Party (NUP), allied with the Khatmiyya religious sect, wanted a union of Sudan with Egypt. The Umma Party, allied with the Mahdists, called for independence. These parties were joined in their struggle by the Sudanese Communist Party and several labor unions. In 1953 Britain agreed to grant the Sudanese self-rule for three years, followed by a vote on the future of the country. In an election for a new parliament, the NUP won the majority of seats, but it soon changed its position and announced that it favored independence for Sudan. In December 1955 the parliament voted unanimously for independence, effective the following month. But northern Muslims dominated the whole process, ignoring southerners’ demands for local autonomy. Just five months before independence, army units in the south rebelled and killed hundreds of northern traders and officials. The NUP and the Umma Party formed a government together, but the political situation remained so unstable that the prime minister invited the military to take power. General Ibrahim Abboud suspended the constitution and outlawed political parties, trade unions, and strikes. The government pursued brutal policies to promote Islam and Arabic culture in the south, where the violent rebellion continued. In 1964 a popular uprising forced the military to surrender control of the state. The new civilian government lasted just four years before being overthrown by another military coup. Colonel Ja’far Nimeiri took over as head of government and, supported by the Communist Party, declared Sudan a socialist state. However, the Communists soon split with Nimeiri and attempted a coup of their own in 1971. Nimeiri held onto power, but he found himself with few remaining allies. He signed a peace treaty with the southern rebels that gave the south some autonomy. To strengthen his hold on power, Nimeiri joined forces with the militant Muslim Brotherhood. At the same time, he repeatedly violated the agreement he signed with the rebels. He declared that Sudan would be ruled by Shari’a, Islamic law. The discovery of oil in the south made him determined to regain control of the region. The south rebelled yet again, this time led by the Sudan People’s Liberation Army (SPLA). A coup drove Nimeiri from power in 1985. In 1989, another military coup brought General Umar Hasan Ahmad al-Beshir to power, supported by the Muslim Brotherhood and a new party, the National Islamic Front (NIF). Beshir promised a return to civilian rule but declared that Sudan would be an Islamic state ruled by Shari’a. The southerners could not accept this policy, and they forced the government to abandon Shari’a in the south two years later. John Garang, leader of the SPLA, demanded self-rule for the south. But some southern groups signed peace agreements with Beshir, and rebel leader Riek Machar joined the government. Other groups called for the south to secede. Some of these splits were caused by friction between two ethnic groups, the Nuer and the Dinka—Garang and most the SPLA belonged to the Dinka. Garang utterly rejected any deal, and the SPLA combined with Beshir opponents from both the south and the north in the new National Democratic Alliance (NDA). The NDA launched armed attacks on dams that supplied electric power to Khartoum, as well as on the pipeline that carried oil from southern oil fields to the Red Sea. In 1999, many of the Dinka and Nuer rebel groups met at the city of Wunlit and signed a treaty called the Wunlit Covenant. Faced with the threat of a reunited southern opposition, Beshir signed a separate peace with the leader of Sadiq al-Mahdi, an influential Islamic politician who had been part of the NDA. With al-Mahdi’s support, Beshir forced a leading Islamic militant, Hassan al-Turabi, from the government. Beshir tried to sell himself as a champion of secular rule. This policy pleased the governments of neighboring states, which were also struggling against fundamentalist Islamic movements. Beshir signed agreements to end hostile relations with Egypt, Uganda, LIBYA, ERITREA, and ETHIOPIA. But while achieving peace with other nations, Beshir launched a new offensive to take over the southern oil fields. International agencies have accused the Sudanese government of killing and enslaving civilians in an attempt to drive all non-Arabs from the area. Meanwhile the civil war with the south continues. The war has had a ruinous effect on the region, with at least 1.5 million dead and 5 million displaced. With food supplies and health care disrupted, starvation and disease are common. Few observers see prospects for peace anytime soon. For many years Sudan has relied on agriculture as the main pillar of its economy. Cotton accounts for more than half of all export earnings. The main cotton-growing region is the area between the White and Blue Niles called the Gezira. In the 1920s the colonial government established a huge irrigation project in the Gezira to grow crops for export. Other important cash crops include coffee, tea, tobacco, and gum arabic. Gum arabic has many uses in candy, cosmetics, and medicines, and Sudan produces more than three quarters of the world’s supply. A terrible drought in 1984 and 1985 took a serious toll on agriculture, and over 250,000 people died in a famine. Oil reserves were discovered in the south in the late 1970s, and the government has fought since that time to exert control over the oil fields. Several foreign companies have significant stakes in Sudan’s oil industry. However, Beshir’s actions in the south have led HUMAN RIGHTS groups to put pressure on these nations to withdraw their investments in the country. Sudan’s geographic diversity is matched by its cultural diversity. The Sudanese speak an estimated 400 different tongues, although Arabic serves many as a common language. While the government has vigorously promoted Islam, about one fourth of the people follow traditional religions. Most non-Muslims live in the southern part of the country. The peoples of northern Sudan share historical connections to the Arab world, but few of these cultures are purely Arabic. The Islamic Funj Sultanate, for example, had links to the black Africans of the Nuba Hills and the Ethiopian border. Most of the people who live along the rivers trace their ancestry to Arab sources and speak Arabic, but their traditions often reveal a Nubian heritage. In many parts of northern Sudan, the word “Arab” simply means a nomadic herder of the desert. Some nomadic Arab populations of Sudan are light-skinned because they have not intermarried much with black Sudanese. However, most northern populations, such as the Baggara, have done so. While these societies usually moved from place to place with their herds of animals, they settled in farming villages and grew crops when conditions for pastoralism were poor. In recent times, West African peoples such as the HAUSA and FULANI from NIGERIA have settled in Sudan. Some were drawn by a desire to establish farms in the Gezira region; others came on their way to Islamic pilgrimages to Arabia.